Holidays are an especially engaging time for brands on social media. In fact, in 2011, 36% of retailers said they planned on spending most of their holiday marketing budget on social media (Source). Sure, most of the attention and money went towards Black Friday, Cyber Monday, and Christmas sales, but who said that the smaller holidays like St. Patrick’s Day couldn’t be engaging? 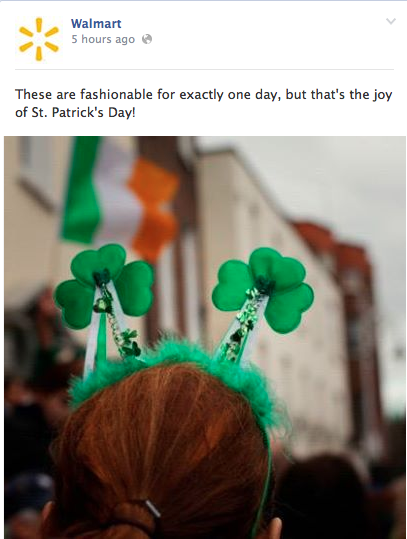 While most brands choose to remain neutral, many big brands would rather not get pinched on the minor holiday of St. Patrick’s Day and have branded their social media pages to celebrate it. 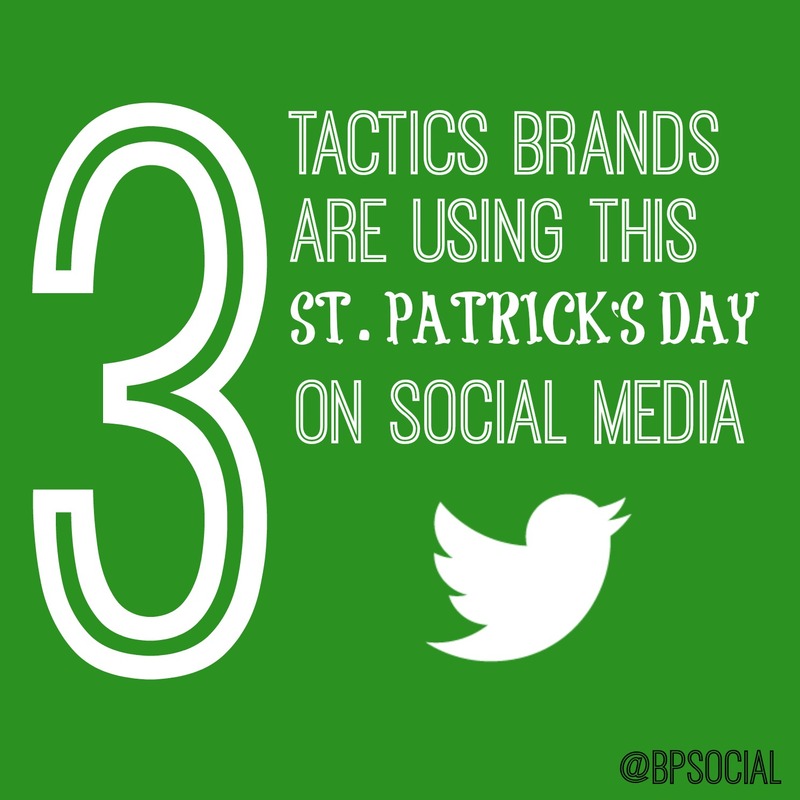 We’ve identified three different tactics that three big brands are using today to promote their brand using St. Patrick’s Day branding. The only Shamrock Shake that’s being spoken about today isn’t the 4.4 rated LA earthquake that occurred early this morning. Moreover, thousands of people are tweeting about McDonald’s seasonal green colored Shamrock Shake. Most people don’t even know what flavor a Shamrock Shake is (mint for inquiring minds). 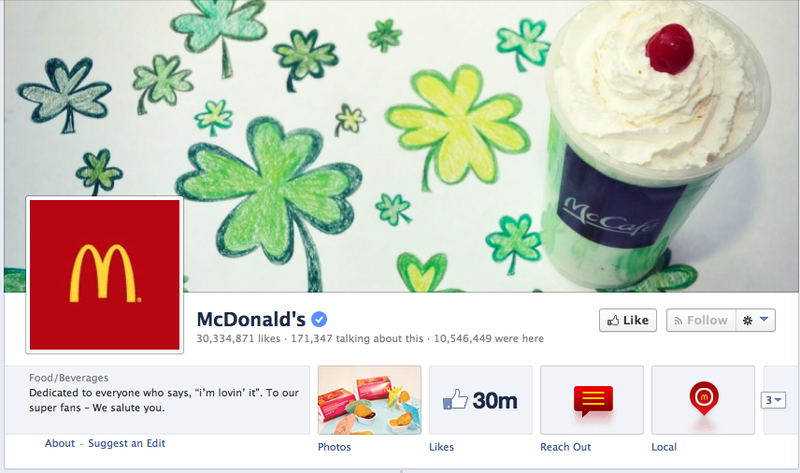 Regardless, McDonald’s pushes its branding for it, as seen on their cover photo. Using a cover photo is extremely useful as it doesn’t require the brand to post often about the product as the product promotes itself simply by existing in this coveted Facebook spot. What flavor is a Shamrock Shake, even? Festive people need to get festive for holidays, big and small. If your brand sells anything related to the holiday (ornaments for Christmas, green things for St. Patty’s Day), make your brand the one-stop for it all. Let your audience know you have it. Your neighborhood Spencer’s Gift store is not only good for naughty adult party favors. Well, actually, we won’t make that claim. But we will point out that they’re running a rather successful St. Patrick’s Day themed sweepstakes-style contest on Instagram. 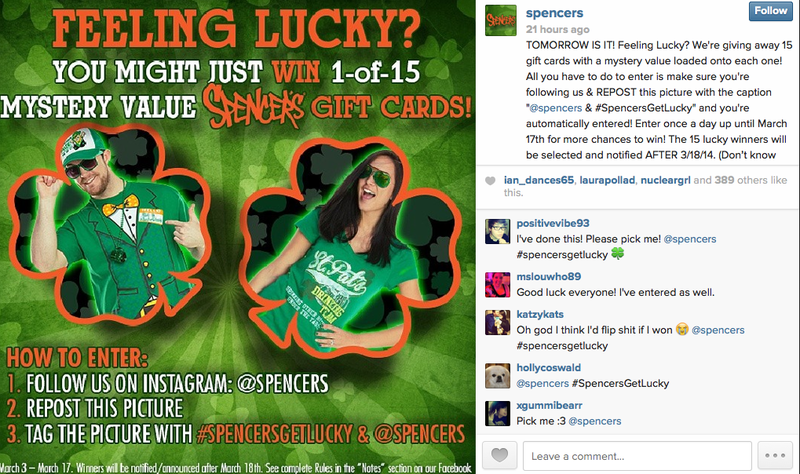 They’ve been running the contest since 3/3, giving all Spencer’s patrons and, more importantly, followers, the chance to win one of 15 gift cards. The thing Spencer’s is doing right here is virality. St. Patty’s Day is perfect for the college-aged, beer drinking, fun-loving audience that Spencer’s has, and by using the holiday as a vehicle to promote themselves, Spencer’s has the opportunity to gain a lot of community. The image scene on Instagram’s around the nation. Though these tips will all help your brand during major holidays, they’re very effective during minor holidays because, as previously mentioned, many brands don’t put forth the little effort it takes. Even efforts as small as saying how you interact with the holiday as a brand (“Hi, we’re Walmart and we sell green things!”) will make your brand stand out from the noise. Michael Wong your article provides proof that the proper combination of technology, people and capital can meet any grand challenge. networking sites are excellent platform to maximize your blog popularity. companies has its own gimick to celebrate each holiday occassions. As social media marketers we have passed the times of using likes and followers as key social media performance indicators and we now see the genuine engagement with our audience to strengthen relationships and build trust in our brands. Thanks for your informative article. Your post helped me a lot in understanding the career prospects in Digital Marketing. Great & very informative Article.Social Media is a great platform for increasng the KPI’s. Which is the best social media platform for brand engaging and builing among facebook,twitter,instagram,pinterest etc. Really very impressive post. Thanks for sharing. Informative blog.We always need to update. Thanks for sharing this wonderful blog with us. Lovely article thanks for sharing this article!!! Really informative and useful Post. Thank you a lot for providing individuals. This is my first visit here. I found some really interesting stuff in your blog. Position Matters is a leading ppc company in chennai, helping clients in setting-up paid campaigns and increase conversions. Get in touch with us! Information about designing and development of website is pretty informative. Thanks for sharing ideas with us.